Christy Barritt has penned articles for Campus Life, Marriage Partnership, Blueridge Country, The Plain Truth, Guideposts for Teens, Brio, and The Lookout. You can find her on the web at www.christybarritt.com. Christy is the author of the Squeaky Clean Mystery Series (Kregel Publications). Hazardous Duty, the first book in the series, took third place in the ACFW Book of the Year contest. 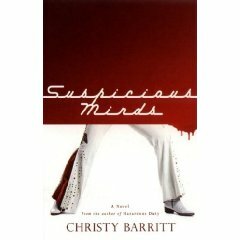 The second book in the series, Suspicious Minds, hit shelves in May 2008. She also co-authored a non-fiction book, Changed: True Stories of Finding God in Christian Music. The book is currently available in Christian bookstores across the country. JS: Christy, welcome to my blog. You’re a busy writer, but you’re also a wife, Mom to a preschooler, and a staff worker at your church. Do you have any words of wisdom for us about how to juggle priorities? Or do we simply have to give up sleep? CB: I’m still learning how to juggle everything! Basically, I’ve just learned to plan carefully and take it one day at a time. At the beginning of each week, I sit down and write a list of everything that needs to get done. Then I prioritize everything. The most important things I get done on the two days of the week when my son is at my mother’s house. Everything else will either get done at naptime or when my husband gets home from work. It’s challenging, no doubt about that! JS: Tell us what a typical day looks like. CB: I really don’t have a typical day. The only “typical” thing about them is in the morning and at night. Every morning, I have coffee and watch the news with my husband before he goes to work. Every night, I try to stop working by 7 p.m. and spend time with my family. The hours in-between vary day by day. Some days, my mom keeps my son and I work furiously. Other days, I take my son to his art class or to a play group or to meet with my prayer partner. I wouldn’t know what to do with myself without my calendar! JS: I’m intrigued by your mystery series. A crime-scene cleaner who solves crimes. I’ll bet an amateur’s interest isn’t exactly welcomed by the professionals. Does that bring complications for your heroine, Gabby St. Claire? CB: Of course! I think the conflict between the police and the heroine is part of the fun of writing a series with an amateur sleuth. It’s more challenging for my protagonist, of course, because she’s not privy to inside information. But she also finds that people will tell her things that they won’t open up about to the police. A good mystery novel should make things as complicated as possible for the protagonist! JS: Real crime-scene cleaners encounter some pretty nasty sights and smells. I can’t imagine going into a career like that. But it makes an interesting angle for your books. In your research, what’s the weirdest bit of trivia you’ve picked up? JS: Suspicious Minds is your latest release. I like the Elvis tie-in. What sparked you to include an Elvis impersonator? CB: I’ve been writing for my local newspaper for five years now. One interview I did was with an Elvis impersonator (or, an Elvis Tribute Artist, as I was quickly informed) performing at a senior citizens’ center. I had no idea what to expect before I went. After I finished the interview (and I’ve had easier times getting interviews with senators than I did with this guy after his show), the president of his fan club came running after me as I walked to my car. She presented me with an autographed picture of him. I thought, this man has a fan club? The ideas spun from there. JS: Is there another Squeaky Clean Mystery in the works? CB: Yes, I’m working on book number three right now. It’s tentatively titled Organized Grime. The mystery in this book centers around Gabby’s best friend, Sierra, who gets herself involved with the wrong eco-friendly crowd. JS: You may have noticed I include a song link with each week’s devotional thought. Some days music is what keeps me sane, so I’m caught by the premise of the non-fiction book you co-authored, Changed: True Stories of Finding God in Christian Music. What has reader response been like for this book? CB: It’s been great. I think music touches a lot of people in different ways. I play the guitar and sing, so music has always been a big part of my life. It’s been a huge comfort to me also. When I’m going through a hard time, oftentimes a song will begin going through my mind. The lyrics many times will speak to whatever situation I’m struggling with. Many readers of Changed have said the same thing. Christian music is very valuable and a great ministry! JS: Is there a particular song that’s made a big difference for you? JS: Thanks for sharing that song. What a beautiful encouragement. Music can have a strong impact. Fiction may be subtler, but it can touch lives too. I’m sure you hear from readers who’ve enjoyed your stories. What’s it like when someone tells you they’ve changed because they connected with some aspect of your novels? CB: I love hearing that my stories have connected with readers. I’m a pretty private person and my heart is revealed through my stories—my books say things that I probably never would. I’ve been doing a series of Mystery Dinner Theatres that feature characters from my books. At the end, all of the cast members give their testimonies. At one, someone accepted Christ as their Saviour. It was amazing! Really, that’s what this is all about… pointing people toward Christ. JS: One question I have to ask: your website mentions your family, pets, and… “a houseplant named Martha.” There’s gotta be a story in there-would you like to tell it? CB: I’m one of those people who does NOT have a green thumb. I’ve killed many, many plants. But I happened to pick up a plant at Walmart seven years ago. I thought for sure it would die too. Amazingly enough, the plant not only stayed alive, it began to grow and flourish! I named her Martha (after Martha Stewart) because she gives me hope that I can do it! It’s a good thing. JS: Thanks so much for taking time to let us get to know you a bit, Christy. I, for one, now have some more books on my wish list. May the LORD continue to bless you and make you a blessing to others-in every area of your life. but the King is definitely dead . . . again. In this smart and suspenseful sequel to Hazardous Duty, crime-scene cleaner Gabby St. Claire finds herself stuck doing mould remediation to pay the bills. But her first day on the job, she uncovers a surprise in a crawl space of a dilapidated home: Elvis, dead as a doornail and still wearing his blue suede shoes. How could she possibly keep her nose out of a case like this? Elvis turns out to be Darnell Evans, a down-on-his-luck impersonator whose luck just got a lot worse. When his widow begs her to help, Gabby takes on the case of who-killed-the-King. In the meantime, her would-be rival, Chad Davis, is turning into one hunka hunka burnin’ love and starting to dish out some serious TLC, which is the last thing Gabby needs right now. Realizing the futility of running from God and from her responsibilities, Gabby decides to reconsider her priorities. But when the ersatz Elvis’s killer catches on to her investigation, will she survive long enough to be able to? 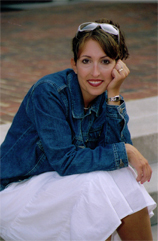 This entry was posted in Interviews, Writers and Books and tagged author interviews, Christian fiction, Christy Barritt, Squeaky Clean Mystery series on August 11, 2008 by Janet Sketchley. sounds like a fun read! and the author sounds down to earth, human. I didn’t know that they had people who clean up after homicides – I thought that was the responsibility of the next of kin. Well you learn something all the time. Good interview – yet another forum for your writing talents, as well as those of your interviewee. Thanks for the introduction to Christy. I loved this interview. She is so real and the way your interview went really makes me want to read this book, and her others. So please do enter me into your contest! Joanna, thank you for including the music video that Christy talked about. I appreciate that. I enjoyed the interview. And the books sound like something I would really like. Sign me up for the giveaway. Thanks for all the enthusiastic comments. How many of you are now humming “Suspicious Minds” throughout your days? Laurie, I once read an interview with an actual crime scene cleaner from Toronto, and that’s way up there on the list of jobs I don’t want to do. I can see how it lends itself to interesting story ideas, though, especially if you add in a twist of humour. Christy, thanks again for the interview. This has been fun. I can relate to the plants! I buy them and they never last I even took a class at Home Depot! Now I have fake plants!